Two persons have died and five are missing after a ship of the port administration in the southern coastal town of Dubrovnik and an inflatable boat crashed on Tuesday late night, the Croatian Ministry of Sea, Traffic and Infrastructure reported on Wednesday morning. The inflatable boat was carrying nine people when it crashed near the island of Kolocep, with a patrol boat being sent out on an emergency call to the island of Mljet in the southern Adriatic waters. Rospotrebnadzor, Russia's consumer rights watchdog group, banned on Wednesday imports of wines produced in Montenegro. The Kremlin banned the wines by the Montenegrin manufacturer "Plantaze". The agency contends that the excessive levels of "plasticisers and pesticides" discovered in these wines led to the decision to suspend the import. Employees in Kosovo's health sector commenced a 24-hour strike on Thursday, starting the protest action at 8am, with only units of vital importance remaining on duty, the trade union of health care employees announced. “We ask for citizens understanding, because our strike, in addition to improving of conditions for the health care employees, has to do also with the improving of the quality of our services for citizens,” the union stated in a press release. A private vehicle belonging to Milos Dancetovic, a Kosovo Police commander in Brnjak, part of the Leposavic Municipality in northern Kosovo, was set on fire early on Wednesday, news agency KosovaPress reported. According to the report, no one was injured in the incident, which is not the first time that police officers in Kosovo’s north have been the target of attacks. 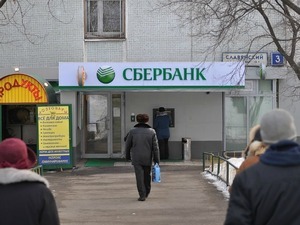 Russian state-owned Sberbank is considering selling the 1.1-billion-euro debt of Croatia’s biggest private company, Agrokor, which is currently in a financial crisis and being managed by the state, the first deputy president of Sberbank, Maksim Poletaev, told Reuters on Tuesday. He said that Sberbank is willing to go to court in order to find a solution for the restructuring of the Agrokor’s debt. With 47 votes in favour and 20 against, Slovenia's parliament passed a law on Tuesday evening which puts the biggest Slovenian retailer, Mercator, under extraordinary management by the state. The law is similar to one recently passed in Croatia which was widely seen as being specifically introduced to manage the crisis facing Agrokor, which is the owner of Mercator. By letting Montenegro join, NATO is showing it wants to tighten its grip on the Balkans, Russian Defense Minister Sergei Shoigu in Moscow on Wednesday. “The military potential of Podgorica is close to zero, though its geographical position permits a strengthening of control over the Balkans,” Shoigu said. 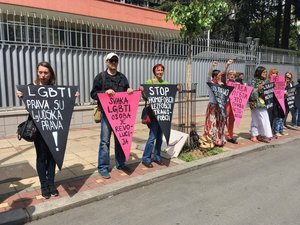 Representatives of the group of Serbian organisations that advocate for LGBT rights staged a protest today in front of the Russian Embassy in Belgrade over the persecution of homosexual people in Chechnya, Beta news agency reported. Activists said they wanted to express solidarity with all people of non-heterosexual orientation that are endangered in the Russian republic of Chechnya and who are subject to state-organised persecution. Ante Ramljak, who Croatia appointed as the ‘extraordinary manager’ of the country’s largest private company Agrokor, is meeting on Thursday with the chairman Bosnia’s Council of Ministers, Denis Zvizdic, and representatives of Agrokor’s daughter companies operating in Bosnia. Ramljak, Zvizdic and the company representatives will discuss Agrokor’s operations in Bosnia, as the troubled company employs more than 5,000 Bosnians and has a massive debt towards Bosnian suppliers. The leader of Bulgaria’s main party, centre-right GERB, and future prime minister Boyko Borissov, saw “a Romanian model” in the recent actions of the Bulgarian prosecution, which launched anti-corruption probes against the state energy regulator and the road infrastructure agency on Monday and Tuesday before announcing it was also investigating the National Electricity Company. “This is the Romanian model. To wake up in the morning and hear who is been investigated,” Borissov said about the work of the State Prosecution, days after citizens demanded the resignation of the Prosecutor General Sotir Tsatsarov over accusations of blackmailing a powerful businessman. 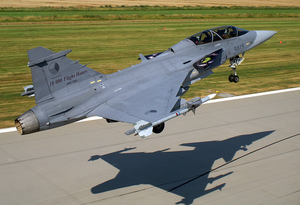 Bulgaria’s caretaker cabinet has favoured acquiring SAAB Gripen Fighter jets for a long-awaited revamp of the country’s Soviet-era airforce among three offers – including secondhand Portuguese F-16 and new Eurofighter Typhoons – during a closed meeting on Wednesday. The decision has to be approved by the Parliament, and may face additional scrutiny by the new government, which is expected to start work at the beginning of May, Bloomberg reported. 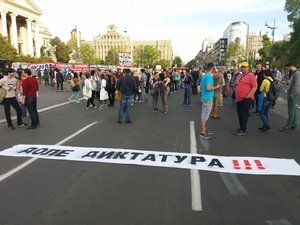 Yet another „Protest Against the Dictatorship“ kicks off in Belgrade. Around 150 protesters blocked traffic in front of the Serbian National Assembly, according to Beta news agency. Earlier today some of the protesters announced that they may try blocking the entrance into the main building of Serbia’s public broadcaster, RTS, during tonight’s rally. 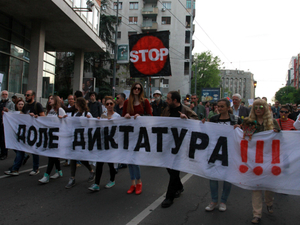 The crowd of several hundred protesters in Belgrade stopped in front of the RTS building. They are demanding a live broadcast of the rally from Serbia’s national broadcaster. broadcaster, RTS, while the TV station was running its scheduled newscast. The rally in Belgrade ended in front of Serbia’s national broadcaster, RTS. The protesters vowed to gather again tomorrow at 6pm at the parliament building. Montenegro said on Wednesday that a decision by Russia to ban imports from its biggest winemaker was politically motivated by the Balkan country's imminent accession to NATO, Agency France Press reported. According to state-owned wine producer Plantaze, Russian authorities have banned the import of its alcohol from Wednesday owing to sanitary failings -- accusations the company denied. 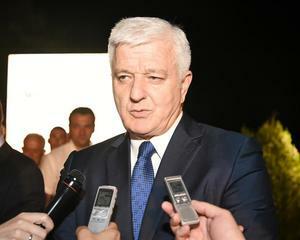 "It is clear that the decision is in the context of NATO membership," said Montenegro's Prime Minister Dusko Markovic. Croatian Prime Minister Andrej Plenkovic asked on Thursday for resignations of three ministers from the junior government Bridge of the Independent Lists, MOST - Interior Minister Vlaho Orepic, Justice Minister Ante Sprlje and Environment Protection and Energy Minister Slaven Dobrovic. Plenkovic has demanded their resignations because the three ministers refused to vote in support of Finance Minister Zdravko Maric ahead of the vote of no-confidence initiated against him by the opposition over his alleged relations with the troubled private company Agrokor. Bird lover Stjepan Vokic, from a village in the Croatian region of Slavonia, has sent a letter to the President of Lebanon, Michel Aoun, asking for his help in stopping birds being killed when they migrate over Lebanon to Europe, saying that over 2 million migratory birds are killed each year while flying over the country. Vokic, who has been taking care of storks at his house for the past 25 years, claims that one of his storks – called Tesla – was killed while making the journey across Lebanon, and included a quill with his letter which he wants Aoun to use to sign a law banning bird hunting during the migration period. Owner of food and drinks manufacturer Swisslion, Rodoljub Draskovic, made an offer to Ivica Todoric, the owner of Croatia’s biggest company, Agrokor, to take over the management of his company’s operations in Serbia, Nedeljnik weekly reported on Thursday. Draskovic is the brother of the head of the Serbian Renewal Movement, Vuk Draskovic, which is part of the ruling coalition in Serbia. After Croatian Prime Minister Andrej Plenkovic asked for the resignations of three ministers earlier on Thursday, Bozo Petrov, chair of the Croatian parliament and president of the junior government party, the Bridge of Independent Lists, MOSTS, said that Plenkovic must decide if he wants the government to fall as a result of the demands for the ministers to step down. Petrov explained that the ministers of justice, interior and environmental protection and energy – who are all from MOST’s ranks – did not vote against the government when they did give their support for Finance Minister Zdravko Maric in a vote of no-confidence, but against Maric personally, whom they think cannot properly perform his duty. Bulgaria’s President Rumen Radev handed GERB’s leader Boyko Borissov a mandate to form a government on Thursday, meaning that Borissov has one week to present Radev with the team of his cabinet, which has to be voted on by the Parliament. 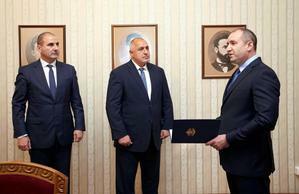 Before meeting the President, Borissov, together with the three leaders of the United Patriots coalition, signed a coalition agreement, with the new cabinet expected to be announced on May 4 or 5. 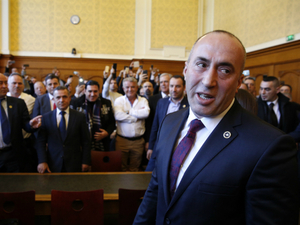 Serbia will send a protest note to France and recall its ambassador in Paris for consultations over French court’s decision to release ex-Kosovo Liberation Army leader turned politician Ramush Haradinaj, Serbian PM Aleksandar Vucic said today. Ante Ramljak, who Croatia appointed as the ‘extraordinary manager’ of the country’s largest private company Agrokor, met with chairman of Bosnia's Council of Ministers Denis Zvizdic on Thursday to discuss possible ramifications of the economic giant's financial ruin in Bosnia. After the meeting, Ramljak and Zvizdic said capital from Agrokor's daughter companies operating in Bosnia will not be used to pay off Agrokor's debt in Croatia, and that the main priority is to maintain the jobs of some 5,200 Bosnians working for Agrokor's companies in the country as well as for Agrokor to pay off the massive accumulated debt towards its Bosnian suppliers. Romanian Social Democrat leader Liviu Dragnea announced he is suing the state at the European Court for Human Rights because of a two-year suspended jail sentence for attempting to rig the 2012 presidential impeachment referendum. PSD chief Liviu Dragnea. Photo: Facebook. Romania’s Supreme Court rejected on Monday his challenge to the sentence he was handed down last year for illegally using his influence within the party to sway the vote against former president Traian Basescu. Dragnea’s bid to become Romania’s new prime minister was rejected by President Klaus Iohannis because of this sentence. The new parliamentary majority in Macedonia will take responsibility for election of a new parliament speaker and new government and will remove the current blockade posed by the right-wing VMRO DPMNE party, the leader of the Social Democrats, SDSM, Zoran Zaev, told a press conference in the Macedonian Parliament on Thursday. "The time for breaking the parliament rulebook, the Constitution and the laws is over. The majority has a duty to unblock the parliament's work. Macedonia must move forward. The majority will elect a new speaker in this hall, in some other on the stairs of the parliament, if need be," Zaev said, not giving any more details on when and how this would happen. Amid previous threats from VMRO DPMNE supporters that they will never allow this, fears have grown that the situation could escalate into violence. A Russian intelligence ship sank in Bosporus Straight on Thursday afternoon after colliding with a cargo ship that had left Romanian Black Sea harbor of Midia -Navodari. The cargo was transporting 8.800 sheep with Jordan as final destination. There were no casualties in the incident. Russian officials did not state the mission of the ship. The Liman had been deployed in the Black Sea in 2016 to monitor the joint Sea Breeze naval exercises between Ukraine and several NATO countries, which included the United States. Russian officials had complained that the joint exercises were provocative. Violence has escalated inside Macedonia's parliament as protesters who are supporting the former ruling VMRO DPMNE party stormed the building, angry over the recent election of new parliament speaker by the new majority. People with hoods over their heads and other protesters first breached the main entrance and later after a short brawl with police managed to enter the press hall where many MP's from the new majority and journalists remain trapped. SDSM President Zoran Zaev, SDSM MP Damjan Mancevski and at least two others were reported by media crews present in the parliament as hurt in the brawl inside the parliament. The tension started just half an hour after on Thursday afternoon the majority of 67 MP's in the 120 seat parliament comprised by the Social Democrats, SDSM, and the parties of the ethnic Albanians, elected the new parliament speaker at just past 16:00 after the provisional speaker tried to end the session. The former ruling VMRO DPMNE party who has been filibustering the constitutive session for one month, not allowing the election of new speaker, said that they would consider this as a "coup attempt and installing of parallel institutions" which they won't allow. 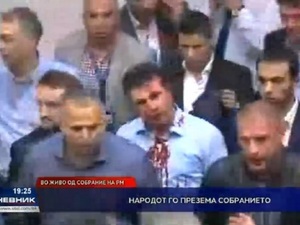 Screen grab showing SDSM leader Zoran Zaev [centre] being hurt inside the parliament building. Masked men storm #Macedonia's Parliament? Democracy=respect vote of majority & use dialogue. Btw. who's responsible 4 protecting Parliament? The head of the DPA- Movement for Reforms, Zijadin Seal has reportedly also been hurt in the violence inside the Macedonian parliament as this photo suggests. Unofficially, Nova TV reported that Sela was not in a critical condition. 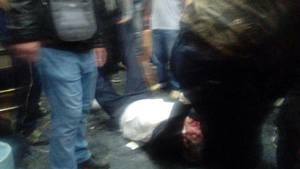 The photo shows Zijadin Sela being badly hurt. Macedonian riot police are now boosting their presence inside the parliament building, which is still being occupied by protesting supporters of the former ruling VMRO DPMNE party. According to media reports, MPs from the new majority are still trapped inside the building. Emergency medical teams told Telma TV that they are currently in the parliament offering help to the injured. 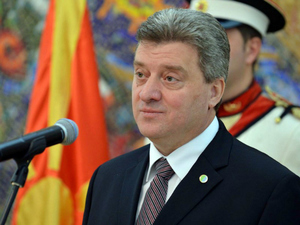 Macedonian President Gjorge Ivanov has announced that he will speak to the nation in a televised address later this evening at around 10pm local time, amid ongoing unrest inside parliament. Riot police reinforcements have been seen arriving at the Macedonian parliament building as media on the ground reported hearing sporadic detonations, which they suggested could be concussion grenades, from inside the building. Medical authorities have confirmed that at least nine people, including MPs and one parliament security guard have been injured during today's violence. "We condemn in the strongest terms today's ongoing attacks on the Members of the Parliament in Skopje. 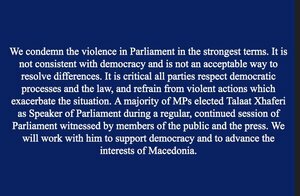 The acts of violence in the Parliament are wholly unacceptable and we call for calm and restraint. The Interior Ministry and the police must ensure the security of the Parliament and its members", said in a joint statement the EU foreign policy chief Federica Mogherini and EU Enlargement Commissioner Johannes Hahn. "Democracy must run its course. 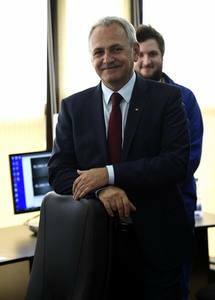 We take positive note of the election of Talat Xhaferi as a Speaker of the Parliament, as reported", the two EU officials said. The TV Telma news crew, which was providing a live feed from inside and in front of the parliament building, has been attacked by a group of protesters, the station reported. At the same time, reports said that all journalists have been removed from the parliament building and its immediate surroundings. Following the situation in #Macedonia. Citizens should not fall pray to provocations. We hope neighbours will move twd Euro-Atlantic path.